Variegated yarns have their pros and cons. There are so many wonderful things about them; the advantages are numerous. Variegated yarns give you the opportunity to end up with a colorful project, without having to weave in bunches of loose ends; it’s also nice to have the assurance that your colors are going to harmonize, especially if you’re a beginner and not yet confident in your color choices. 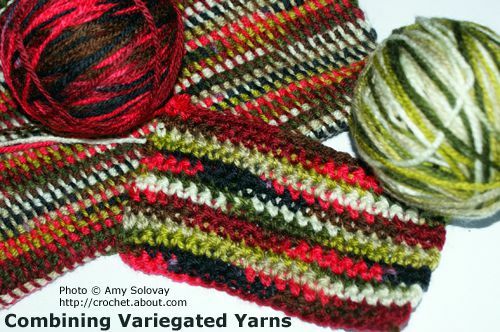 Variegated yarns are notoriously challenging to work with, especially for crocheters. They don’t always give you the results you expect, and sometimes the finished results can be disappointing. Note that you can achieve drastically different results depending on which yarns you start with. For most of the following examples, I've used the yarns pictured in the photo above -- a red, brown and black colorway combined with a green and gray colorway. There are additional examples linked throughout the tutorial, made using a wide variety of different colorways. One way to combine variegated yarns: when working in afghan stitch, crochet the forward pass in the first yarn colorway, and the return in the second yarn colorway. Continue crocheting the forward pass of the next row in the same colorway; then drop that color and pick up the first color to complete the return. Repeat. Even if you start out with two mismatched variegated colorways, this combination could possibly result in an interesting fabric. If you start with two variegated colorways that harmonize well, this combination usually turns out stunning! A Bonus: With most stitch patterns that are this colorful, you’d have to weave in bunches and bunches of loose ends to finish your project. Not with this stitch pattern! Because at the end of each row, you can simply drop the color you are using, and pick up the other inactive color, without any need to cut the colors in between rows. You won’t need to weave in any extra ends when you work this stitch – just the usual loose ends at the beginning and end of the project. When working in the Tunisian knit stitch, crochet the forward pass in the first yarn colorway, and the return in the second yarn colorway. Continue using the second colorway for the forward in the next row; drop that color and pick up the first color to complete the return. Repeat. Do not cut the colors in between passes; just drop each yarn when you’re finished with ​it and pick it up when you need it again. There’s no need for weaving in lots of loose ends, just the usual loose ends at the beginning and end of the project. Try a Project With This Stitch Pattern: ​This faux knit headband utilizes the stitch pattern you see pictured above. This is a quick and simple project that would make a nice addition to anyone's wardrobe. Two rows of the first colorway worked in single crochet. Two rows of the second colorway worked in single crochet. To minimize the amount of yarn ends that need weaving in, you can carry your yarn up the sides of your work. If you want to try using the tapestry crochet technique with variegated yarn, Start with a simple checkerboard pattern. You can get good results with bunches of different tapestry crochet design elements – circles, triangles, flowers, etc. In my experience, bold patterns tend to work better than detailed ones do. Tapestry crochet patterns are a little hit-and-miss when it comes to using them with variegated yarns. Sometimes, they turn out amazing, and sometimes they look pretty weird. Choose two different variegated yarns from two distinct color families. The yarns should contrast with each other, but there shouldn’t be a lot of contrast between the darkest and lightest color in each yarn. With the yarns specified in example #1, you can work a checkerboard chart and have a reasonably good chance of a distinctive checkerboard pattern appearing in your finished design. With the yarns specified in example #2, you’d most likely end up with a mess. It would be surprising if you could clearly distinguish the checkerboard design. The black in yarn #1 would be indistinguishable from the black in yarn #2; same with the whites. Conclusion: Parts of this colorway are pleasing, but parts of it are less successful. The dark forest green from the first colorway looks quite a bit like the brown in the second colorway. Due to this similarity, it is difficult to maintain a crisp and distinct difference between the checkerboard blocks in the pattern in the areas where these colors appear. If not for that, this choice of yarns would be much better. Takeaway: When using variegated yarn for working a tapestry crochet pattern with two or more distinct color areas, compare the individual colors in colorway A against colorway B. If any of them look very similar to each other, you may wish to choose different yarns. At the very least, make a swatch before proceeding. Please don't feel limited to working with only two colors. Why stop there? You can work with as many colors as you want to. It can be interesting to combine bunches and bunches of different variegated colorways into the same piece -- assuming, of course, that there are enough unifying elements in the yarns to visually tie them all together in some way. If you're going to use multiple colors, one successful approach is to choose colors that will transition nicely into each other and to work them in gradient patterns like the one pictured here. The example pictured above is a potholder worked in afghan stitch and finished with a pretty v-stitch edging. To achieve this look, take a basic potholder pattern and substituted five different variegated yarns in the body of the potholder. To do the edging, use a solid yellow yarn. Please note that several of these yarn colors have now been discontinued; if you want to try out this idea in the future, you can apply the concepts you've learned with other yarns that are currently available.